Sam Horn, America's "intrigue expert" and the author of "POP! Create the Perfect Pitch, Title and Tagline for Anything" will be speaking in Austin, Texas on Friday, June 18th. This event is sponsored by the Austin Speaker's Network (the group working on founding the Austin Chapter of the National Speakers Association), but is not limited to professional speakers. Sam has the ability to help spark creativity for people in any industry. I encourage you to attend. The cost of the event is $99 (if you register before June 1st.... after that it is $149). This is a deal by any definition. Morning Session - "POP! Your Business"
Afternoon Sesssion - "Want to Fast Forward Your Book?" Both are included for the one low registration fee. I predict this event will sell out. I saw her speak five years ago, and her presentation had both short term and long term transformational impact. This seminar is right for you if you are a speaker, author, copywriter, consultant, entrepreneur, Marketing & PR Strategist, Advertising executive, branding expert, or just someone who knows that a "pop" of creativity would make you more powerful in your career. Sign up today. Thank me later! Over the past decade the buzzword "Best Practices" has become pervasive in business. In theory I am a fan of the concept, as there are too many people who waste time and money trying to create their own road when a giant freeway already exists. It is good when we can learn from others and thus find quicker ways to create our own velocity. However, many executives use the term as a crutch (as they do with most trendy business "buzzwords"). One manager I know spends so much time looking for best practices that he never appears to have any practices at all. Additionally, many misuse perceived best practices and end up with watered down policies and procedures that limit their success. My friend (Brigitte Benquet) recently said "Best practices poorly executed are not best practices". This statement rung in my ears the rest of the day. It is both simple and true. If we seek best practices we must both implement them properly and adapt them for our own unique situation. A best practice is a tool, not a magic button. Like any tool, it must be understood, sharpened and used correctly to provide efficiencies. Finally, a commonly accepted practice or rule is not necessarily a "best practice". We toss such terms around so freely that they become cliche. If you are a fan of "best practices" (as I am), make sure you are really looking for those ideas that are positively revolutionary to your business. "As the term has become more popular, some organizations have begun using the term "best practices" to refer to what are in fact merely 'rules', causing a linguistic drift in which a new term such as "good ideas" is needed to refer to what would previously have been called "best practices." I have been very outspoken lately with clients about the importance of conducting "Networking Audits". Too much money is being wasted inside companies, law firms and other organizations with employees joining groups and never participating. 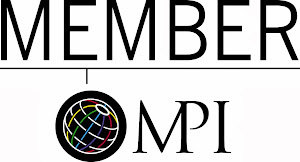 Being listed in a membership directory has almost no value in today's busy world. Being a member only has power if you participate. 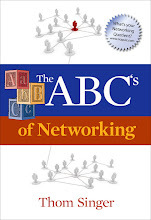 Individuals need to understand that they need to put time into networking organizations to get results. Companies need to look at the money they are spending on orphaned memberships and decide if that money can be better used in other areas. 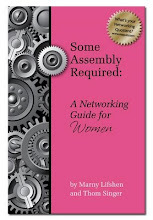 For more information on conducting a "Networking Audit", give me a call or send me an email. 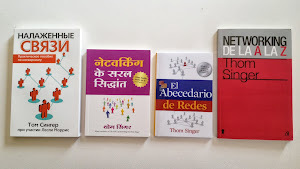 I am an avid reader of business books, self-help books, technology books, social media books, career books, and other similar genres. I have averaged reading over 20 books a year for eighteen years. That is a lot of information! I also have a personal policy that if I know someone who wrote a book, I read it. In 1989 I met an author and he gave me a copy of his auto-biography. I read the whole thing and then sent him a "Thank You" note. He responded with a call telling me that the greatest compliment an author can receive is for someone to read their work. I took that to heart and made this my mantra. This policy was easy for the next several years as I did not encounter that many authors. 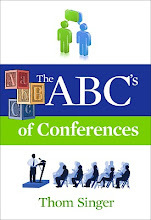 However now that I have written eight books of my own, and regularly find myself sharing the stage as a professional speaker at conferences and conventions with many top authors, I now meet a ton of people who have penned a book. Thus I find it hard to keep up with my policy of reading the books of those I know. Online Marketing Inside Out by Brandon Eley and Shayne Tilley. I met Brandon at the 2010 South by Southwest Interactive conference. We had a great conversation about the professional speaking business, social media, networking, and the real power of cultivating business relationships. His book is a great guide for those who are still on the sidelines of social media. While most of the people I know are more advanced when it comes to using the internet to promote their business, the majority of businesses out there are still wondering how they can harness the power of social networks. The book is easy to read and logical in how it is laid out. My favorite part is where the authors remind the readers to be human: "One of the most common mistakes companies make when trying social media is that they maintain that corporate facade instead of behaving like normal, everyday human beings". Valerie is a former corporate executive who realized that she was not living in alignment. She walked away from a high paying job and followed her dreams, which included writing this book. She is living her own "professional destiny" and is passionate about helping others find theirs. I met Valerie through a mutual friend, but had already heard here name in local circles in Austin, Texas. The book does a great job of encouraging the reader to let their personal gifts and passions guide them to finding their path. "Your true purpose is your highest good and it brings you great joy", says Hausladen. I met Shama at the 2008 South by Southwest Interactive Conference. I had already been following her on Twitter, but a chance meeting and a group impromptu trip to lunch made us fast friends. She is one of those who has the right to teach social media because she has not only lived it for several years, but has created real business for her company by her participation. 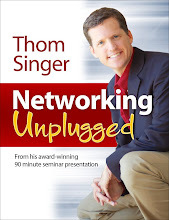 The forward of the book is written by social media guru, Chris Brogan, which gives the book even more credibility. The book is ideal for those who know their continued avoidance of social media is just plain dumb. All industries can benefit from understanding this medium. Shama says "It is no longer a question of whether social media will influence your customers and your market - it already is!" I have known Steve Harper (AKA: "Mr. Ripple") for over five years. We met as we were both releasing books on the power of business relationships and have remained friends. His "8 Minute Ripple Seminars" are held regularly in Austin and around the country, and help people make meaningful connections. His original book was already good, but many things have happened in the way we manage relationships over the past five years. Steve has released this new version of his book to expand on the theories and include the powerful additions of the new technologies that impact how we make connections. The added chapters (Chapter Five on using social media, Chapter Six on building and utilizing your network in tough times, and Chapter Ten is filled with real life stories of people creating "Ripples") makes this already great book even better. Harper is right on the money when he says, "The people that influence us become the brush strokes of the masterpiece we paint called our life." No matter your level of experience with the topics covered in these books, you will walk away with more knowledge from these well written books by authors I know. All four books are wonderful, and all four authors are way-cool people! Jamie Oliver's Food Revolution - Could YOU Start Your Own Revolution? Friday concluded the television show "Jamie Oliver's Food Revolution" on ABC. The series featured a celebrity chef, Jamie Oliver, on a one man crusade to teach the people of Huntington, PA to eat better foods. He focused on Huntington because it was labeled the most unhealthy place in America. He then spent much of the show uncovering the horrible processed foods that are being served in the schools. The ingredients in the chicken nuggets and burgers, and the high levels of sugar were shocking. Oliver had done this before, as he is credited with getting major changes in the school meals in his native United Kingdom, with a similar television show. It is no secret that Americans do not live a healthy lifestyle, and Oliver thinks change is possible: "I believe that every child in America has the right to fresh, nutritious school meals, and that every family deserves real, honest, wholesome food." He is right. The show was informative and gross at the same time. Interestingly my kids have decided to skip the school meals for over a month and have had their mom make them lunches without processed foods. Around our house we try to avoid many pre-packaged meals with ingredients that cannot be pronounced. We strive for fresh meat and vegetables at the main portions (It helps that my wife is a great cook and the author of the "Mad at Martha Cookbook"), thus our children were not surprised at just how bad for them processed foods can be. But on the television show the families featured had no idea what they were eating in their meals. All the food was tan (no green or other colors...ick). What struck me most about the show was the passion of the host. Jamie Oliver was not faking his enthusiasm for teaching the citizens of Huntington about nutrition. His from the heart desire to be a catalyst for change actually had an impact. Granted, once he was gone, many people (and the school board) went back to frozen processed foods, they did so with trepidation. Many of those featured on the show who embraced his focus on better eating showed health improvements and lost weight. What are you passionate about? Does your cause impact others? Could you start a revolution? I believe anyone can impact change. You do not need to be a celebrity or create a reality TV show to be a catalyst for change, just passion. I see people everyday who are passionate in their work to impact others who are catapulted to the top. Thus it is a win / win situation. They help others and are both financially and emotionally satisfied in their careers. If you are not living your dream in your work, then you need to look closely at your passions. Find ways to transition yourself from someone who is in a rut to someone who is leading a revolution. We welcome co-author Anne Brown (who also wrote "Grad to Great") into the New Year Publishing family with a new website that highlights the SAR books and the authors and professional speakers who are part of the series. Visit the new website and let us know what you think. If your company, law firm, college / university or professional organization is planning an upcoming meeting, convention, users conference or sales kick-off, consider having Thom Singer, Marny Lifshen, Chad Goldwasser or Anne Brown on your list for keynote speakers or workshop facilitator. More information at the NYP SPeakers website. If your company does not have a "Business Development Culture" what can you do? If your industry is changing and you know that your firm must adjust to the new realities of marketing, business development and social media, what can you do? If nobody in your business seems to know or care that you competition is gaining traction, what can you do? You can lead by example!!! One person can be the catalyst for change inside a company of skeptics wearing blinders. I spoke to a professional the other day who said his firm was in need of a business development make-over. He is convinced that they are not getting all the business they could, yet they are successful, despite themselves. He sees changes happening and competitors gaining traction, meanwhile clients are seeing their services as a commodity. He talked to his partners about hiring a consultant to help them assess their client development and branding issues, and they laughed at him. He said that it was almost painful to see his partners be so arrogant and self assured. He has worked with them for six years, and admired the business they built (he joined the firm as a lateral hire from a more progressive competitor), but he was shocked at their lack of understanding of basic business practices, and the power of social media and other marketing efforts. His partners are convinced that good work alone will continue to provide a robust pipeline. He has decided to quit fighting, and instead he is going to work on expanding his own brand in the business community. He is investing his own money on a business coach and will begin to expand his personal brand. However, he is not going to share his efforts with his co-workers. He no longer feels his partnership is one where everyone has a voice at the table. His partners are 100% convinced they are right and will not entertain any other point of view. He believes that bringing the topic up again will undermine his standing in the firm. He sees changes happening in his industry, and wants to position his value with clients, referral sources and competitors (for future employment) independent of his current firm. In the sea of changes he wants to ensure he has options in the future. He thinks a train is leaving the station and his firm has not bought a ticket. I assured him that in addition to building his personal brand, when he hits his goals in business development efforts, that his partners will notice his success. Nothing speaks as loud as victory. In his industry people are judged directly by the money they can bring into the firm. If his billings go up, then others will notice. Rather than fighting the naysayers around you, educate them through your actions. Invest the time to create your own personal and professional brand. Become a beacon for action and do not passively sit on the sidelines. Many industries are still strained from the recession, and changes are happening around everyone. This is not the time to stick your head in the sand. I saw this video several years ago (it was created for the Legal Marketing Association annual conference). If you work in or around marketing for a professional services firm you will get a kick out of spending a few minutes watching and laughing. If you are a partner or senior executive in a law firm, accounting firm, bank or other professional services firm, you will also find it funny. Although, you will NOT see yourself or your partners in the characters lampooned in this video. Nooooooo, not YOUR firm,.... it is the others! I am currently accepting law firm or other professional services coaching clients. This is ideal for small firms or individuals who are aware they need to increase their visibility in their business community to increase their long term business development efforts. All opportunities come from people, so how you cultivate mutually beneficial relationships will have an impact on your success. Your marketing, brand, business development, networking, PR, social media, advertising and sales efforts all must work together if you expect results. Contact me at thom (at) thomsinger.com or (512)970-0398. 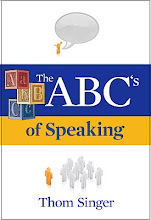 Have You Read "The ABC's of Speaking"? How To Scale Your Life? Scalability is something that all entrepreneurs think about. Taking their business to the next level, while increasing functionality and increasing the number of clients they serve, hopefully brings with it more profit and success. Investors contemplate if a company can scale before they invest, as the money folks do not want a flat line. Growth is important to most long-term business plans. It takes different resources to scale a business beyond the initial stages. Not all companies are able to do this, and not every entrepreneurs has the desire to create a larger enterprise. But for those who have this ambition, the ability to manage the changes is important. The same thing is true in life. The habits and skills that got you to your current position may not scale to get you to the next step. We must adapt and change the actions we take if we want to expand our effectiveness in any area. I feel these pressures in both my career and personal life. After a lifetime of working for other people's companies, I began working for myself twelve months ago. It is a different world, and I have struggled with the changes in how I make the choices of how I spend my time. I am happier, but also hungrier to do more. The biggest change I have had to face was how I manage myself (and time). There are more people who want to "pick my brain", more opportunities to speak, more responsibilities to existing clients, and a focus on finding new business. Everything I do has more importance and significance. Being a small business (both for NYP Speakers and my own speaking career), there is not a full staff to whom I can delegate. However, at the same time, I do not want to be one of those people who shuts out others. My success has always come from having mutually beneficial relationships in my network, and I have seen too many entrepreneurs who get busy and then avoid people. The concept of a network that lead them to the top becomes a bother. They rationalize they cannot scale, but I am not sold on the fact that success means you have to put up walls. It just means you have to find other ways to manage it all. I read a passage in a book recently that suggested entrepreneurs pre-judge the people to whom they allow time on the calendar, as time is the ultra-valuable asset. It implied that one should only meet with those who can be predetermined to bring benefit to the entrepreneur. Between the lines it said you should ask "so what is in this meeting for ME?" before ever talking with someone. Wow, the best things sometimes come from directions you are not looking, so this could be limiting. Pre-judging everyone can't be the answer, as it seems too selfish. I understand that there are only limited hours in the day. Yet, scalability does not requires a person to become focused only their self-importance. The best answer I ever witnessed was a CEO of a multi-million dollar company who allowed anyone who wanted 30 minutes on his calendar (sales people, those who want to network, etc...) to have his time at either 6:30 AM or 7:00 AM. He was an early riser and enjoyed getting to the office early. I took one of those spots on his calendar (and closed a sale). He told me that most people declined the early hour. With 52 weeks in a year, and five work days each week, he offered availability to 510 people (granted, sometimes he was gone or on vacation, but you get the idea) to get on his calendar. He told me only a couple of dozen ever showed up. But he had never wanted let his success make him shut people out of his life. I do not yet have all the answers. I am grateful that I am having to face these questions, as I am getting more speaking engagements, more consulting clients, and NYP Speakers (and New Year Publishing) are continuing to grow. Along with the good things that come from creating a sustainable business, comes more questions on how to scale my life. Keeping up with emails, making sure my family knows they are my priority, WOWWING clients, finding time to prospect, and not getting worn out by it all can be overwhelming. What suggestions do you have to scale as your time becomes more limited? Could the people who hire you switch to a competitor and not miss you? Could your boss replace you and have no hiccups in their business? Are you important to the success of others? Are you relevant to their business plan? Do they know that you help them succeed? If your product or service is a commodity (or the clients can mistakenly think you are a commodity) then you have to do more than "your job" if you want to keep your job. Seek ways to provide value beyond what you are charging. Have an interest in people, and let them see that you care about them as a person. Go deep in your empathy. I worked with a vendor who clearly only saw our relationship as one where I paid them for services. I tried to establish a more meaningful friendship, as there was the opportunity for long term work (and referrals), but they were all business. They were also replaceable. That company no longer gets my money. Concentrate on creating and cultivating meaningful and mutually beneficial relationships and you will get both the work and the joy of being an important part of the lives of others. Be "all business" and you will have a lot of "transactions". You will also have to work much harder on finding new clients, as your current ones will eventually move on to your competition. April is the right time to examine the velocity on your plan for the year. Have no plan? It is not too late to create one and focus your energy. If you want a victory in your life this year you have to know what success looks like. Behind on plan? There is still a lot of time to catch up. Wait too long and the year will be lost. Confused? Lethargic? Tired? Lazy? Lost? It happens to everyone. Snap out of it now before you find yourself in a spiral of blah. Exceeding expectations? Rock and Roll. But do not get complacent. Reassess your trajectory and maximize your efforts. PS- Do you know someone who needs a business or life booster shot? 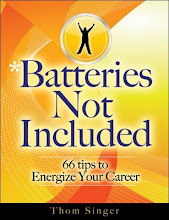 Send them a copy of "Batteries Not Included: 66 Tips to Energize Your Career". 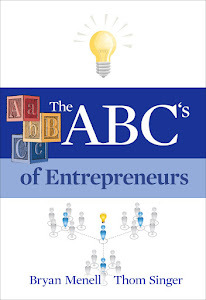 It is praised as a great book for motivating anyone who needs to create small victories in their daily routine. Sign up now for the "Some Assembly Required Webinar"
Pay once and bring your whole office into a conference room to participate. Each person in your company needs to care about their network, personal brand, and the company's visibility in the business community. If your employees do not give a darn about these things, then your business is leaving money on the table. Think about this for a minute: As an entrepreneur, business owner and manager of people..... would you stand up and tell the world.... "My people don't care, and I don't care that they don't care!" ? Nobody I know feels that way. So do not ignore this topic! The webinar is designed as a catalyst to make people think about the power of business relationships and networking. After the session your team will be inspired to talk more about the important things that help get your firm more business. "You Make It Very Easy To Do Business With You"
A client who has hired me to speak at a banquet recently said, "you make it very easy to do business with you". I appreciated the compliment, as I do try to bring ease to every transaction. I enjoy my career as a speaker and consultant, and thus I am enthusiastic about all aspects my work. However, this comment got me to thinking. I had not done anything spectacular. I simply have customized my pre-program planning to meet his schedule and specific desires. Why would a speaker, or any vendor, not make the clients unique needs a top priority? What would your clients say? If I called them up and asked them if you were "easy to work with" how would their answers frame your services? A free day in Seattle lead me to playing tourist. I was in town to give two speeches over the following few days, but had just enough time to enjoy one of my favorite cities. Just near the Pike Place Market, after my regular pilgrimage to the original Starbucks, I ducked into a small shop to get out of the rain (what? rain in Seattle?). The sight of wines, olive oils, vinegars, pastas, and jellies coupled with the allure of samples, made it very inviting. While the gourmet products that they sold were great, it was the owner of the shop and her delightful disposition that made the encounter memorable. She talked to all the patrons in her store and offered up an incredible combination of tastes and information. The truffle infused honey and the dollop of 15 year old balsamic vinegar were both amazing to the palate. I was reminded by this experience that personality, customer focus and making others feel like important and honored guests is key to success. This is not only true for the purveyor of specialty foods, but for everyone in any industry. People do business with those they know, like and trust. If you do not make an effort to connect with others they will never buy your products or services. I could not have imagined leaving this store without buying something. I purchased a small gift of truffle salts for my wife (who is an amazing cook and loves little shops like this one!). If you are ever in Seattle, stop in at La Buona Travola (1524 Pike Place) to get your truffled products and exceptional Italian regional specialties. Look for the owner, Rei Hanscomb.... she clearly loves what she does for a living! People enjoy doing business with those who love their work. I love it when I see those who are farther up the career ladder reach back and extend a hand to help someone else with their climb. Success is not something that happens in a vacuum. We are all assisted along the way by someone. However it is common in our "Cowboy Society" for people who find high levels of achievement to start believing their own press, and forget about the reality of their own rise to the top. We want to have this image of being "self-made", but few people ever really do it alone. In the third season of the television show "Mad Men" there is a great quote. Bert (the founder of the ad agency) tells Don (the main character) "that Sacajawea crossed the country with a baby on her back, and somewhere there’s a baby who thinks he discovered the Pacific Ocean". The point being that others helped Don succeed, and it was time he paid them back! We all come in on others’ shoulders, and we should never forget that. I have met professionals who understand this, and I have met those who think they discovered oceans by themselves. I recently had an experience where I was offered assistance by someone in the top 1% of my profession. I was both honored and impressed by his enthusiasm to introduce me to some key people. This offer, and his follow up (with some pointed questions), was a window into his soul, and the view was of a real person who loves others. He wants to be a catalyst for success in the lives of others. While this is the subject that he writes and speaks about, not everyone practices what they preach. The movie "Pay It Forward" best sums it up: When you help someone, and then they help someone, etc.... the world is a better place for everyone. How about you? Are there people behind you in their career journey who you could give a boost? Would you do it? Have you done it? The video below is from Gary Vaynerchuk. He has declared today (April 3rd) "Good People Day". He began this in 2008. I love this concept. I spent several Decembers doing the "Praise Others Project" (2006), the "Celebrate Passion Project" (2007) and the "Celebrate Austin Entrepreneurs Projects" (2008) on this blog, but the concept fell short with some readers. I wanted others to embrace the idea of praise on their blogs, but nobody bit on the idea. Seems it is hard to get people excited about dedicating time to discovering and talking about what makes other people awesome. Maybe the huge audience that Gary Vee has online will cause praise to be the hottest topic online today. Think about it. What if you went crazy today praising others. Then what if everyone else did the same thing. Imagine the good vibes that would flood the universe. I want to try to get the WHOLE INTERNET Community behind this mission I have to make sure that tomorrow people write and talk abd blog and twitter and just flat out SING about people that are AWESOME and GOOD. It is time that we take control of the fact that WE are the media and pump out a day tomorrow that will make NOISE across this WORLD! Please take the time tonight to gather your thoughts as you come up with ideas on how to spread the word about AWESOME people! I am looking for blog posts, twitters, powncers, facebooking, digging, flickring, stumpling on all things that are good about PEOPLE! I began making a list of all the "Good People" I know. The problem is the list was too long and I just know I would leave someone out, and thus I would offend. But I do need to praise the heck out of my family. My wife, Sara, and my kids put up with my crazy transition to being an entrepreneur, with all the travel, long hours and sacrifice that goes with it. I am not sure they know that I am not just doing this for myself (I am loving it), but there is a greater motivation than just personal reasons. It involves them, too! I praise them for their support and for just being cool, funny and very crucial to my success. I had the honor to speak at the Rotary Club of Northwest Austin this morning. They had asked me to create a new, fresh and different presentation. As a professional speaker who has addressed over 110 audiences in the last twenty months, I could not use the framework of one of the talks that I am hired to present around the country at law firms, corporations and association conferences (the topics of the power of business relationships, networking, "Integrated Visibility", personal branding, social media were off the table). While every talk I do is customized for the audience, they were not interested in hearing me speak on my regular subjects. Instead, the person in charge of programs for the club wanted me to to create a motivational talk that utilized my eclectic career path and unique background of working for seven companies that closed down or experienced layoffs. Having seen the collapse (or reorganization) of so many companies over twenty years apparently gives me a close up and personal view of the realities of recessions. "Never Quit The Journey" turned out to be a new and exciting presentation. While I make no secret of my bumpy road to success.... I had never given a speech about my own life in this much detail. I wanted the story to be informative and motivational. Preparing the discussion was simultaneously fun and painful, as I recounted the fact that my first job, a busboy at the Big Yellow House Restaurant in Monrovia, California ended abruptly when the parent company (Great American Restaurants, Inc.) filed for bankruptcy. At 17 years old I had no idea of the foreshadowing occurring the day I drove up to find the place boarded up. Nobody could have predicted the commonality of that event throughout my career, but it was an important early lesson that life goes on. Near the end of the talk I announced that "I am living my dream". I had experienced jobs that were equally as satisfying as self-employment, and the lesson is that once you have lived great joy in your career, you are never again satisfied with anything less. I encouraged the audience never to settle. It was a bit scary to say out loud, with gusto, to a large audience... that "I am living my dream!!!". But I have learned from my experiences as a speaker that anything you share that is real and authentic should never be feared. It brought with it applause and approval from the crowd. Afterward one person asked me if I thought everyone could "live their dream"? Yes, I do believe that people can live their dreams. Each week I get to present to a variety of professional audiences from small local Rotary Clubs to company sales meetings to major industry conventions. I meet amazing people and hopefully motivate, educate and inspire those who sit and hear my talks. New Year Publishing and NYP Speakers continue to grow and provide valuable services to those with whom we work. My wife and kids are happy (and seem to like me most of the time!!! ), and I even find a little time for myself to read a book or go to the gym (the full dream involves losing eight more pounds!). A fulfilling career will have its share of surprises. There can be twists, turns and bumps in the road, but if you have a dream, keep working your way toward making it your reality. Never quit the journey!